I have found the perfect brownie recipe. It is made with cocoa and oil so it is dairy free (parev) and oh so good. I make the recipe as is and depending which way my mood takes me I fold through pecan nuts or swirl peanut butter through. They are also wonderful when poured into the pan and a third is swirled with peanut butter, a third with chocolate chips and the other third left plain or pecans dotted over. 2. Place eggs and sugar in a mix-master and beat well together. 3. Add oil and vanilla and mix. 4. Sift flour and cocoa together in a separate mixing bowl and add slowly beating all the time. 5. Grease a large baking tray. I use a 36×28 cm pan. 6. Pour the mixture in and bake for 25 minutes. 7. Leave to cool in the pan before cutting into squares and place on a serving platter. 1. Add 1 cup chocolate chips and fold in before baking. 2. Add 100g broken pecan nuts and fold through before baking. 4. 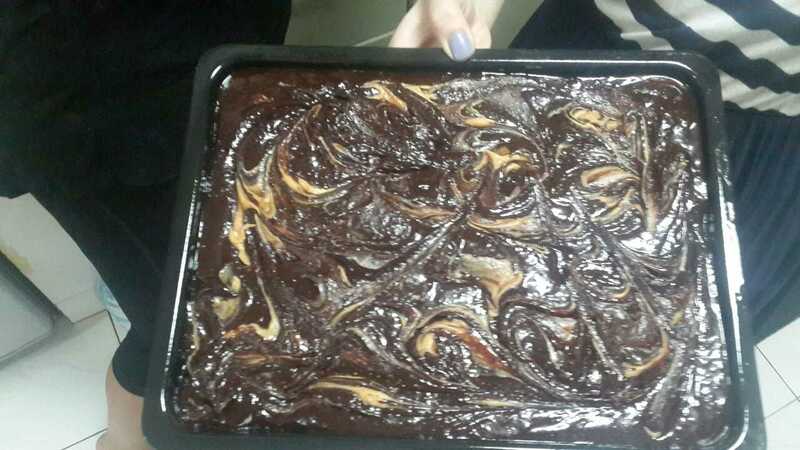 Once the brownies come out the oven and cool you can spread melted chocolate over. Leave to set before removing from the pan.